Finding the right church chair is a really important decision to make. It’s a big financial commitment for most churches, and it’s likely that the chairs will be around for a long time. Here are some key attributes to consider when looking at church chairs. What do you really require? Whether it’s a refurbishment, a new build, or simply a purchase of new furniture, there are a multitude of options for the layout and configuration of your church seating. It’s good to have a clear idea and plan around the type of chairs and seating arrangements you require. This should consider your practical needs for the space. Does it need to be reconfigured? How many people does it need to fit? How can you ensure a good view for everyone seated? * A tiered facility with fixed auditorium or theater church seating with either riser mount or beam mounted seating. For big churches, this is critical to ensure everyone can see what’s going on. Whatever the style, it’s a good idea to think about all the demands and requirements for your venue and plan your seating around a solution allows you to best optimize that space. No-one wants a congregation of slouchers. Church services can go for a long time, and, if you want people to be able to concentrate on the service (rather than the relative pain in their bottom), a comfortable church chair is crucial. The two biggest considerations around comfort are correct back angle and quality of foam. Foam is everything. If you’re buying chairs, know your foam! Foam with insufficient support leaves you feeling like you’re sitting straight on hardwood after half an hour or so (which is exactly what you are doing). Cold molded foam is the technology used in automobile seats and is a major improvement over cut foam. It has great density (read support) over a long time period, and also has a waterproof skin that repels moisture (cut foam behaves alarmingly like a sponge to spilled fluids). Ask your supplier about cold molded foam and, if they offer it, test it against cut foam to really see the difference. Additionally, things like the shape of the foam at the front of the chair (i.e., waterfall rolls) can create greater leg support and lumbar support at the right angle and ensure good posture. When searching for church chairs to buy, they can all start looking the same. When it comes to longevity, however, it’s all the little finishes that matter. The type of screws and how these are attached to the back of the chair are important. Screws placed directly into the wood seat back can unthread over time and eventually fall out. Other features like powder coating on the frames for rust prevention, chair testing to pass fire regulations and fabric protection measures such as scotch guarding or knowing the UV rating/effects on your fabrics all add up to ensuring your seating lasts for as long as possible. 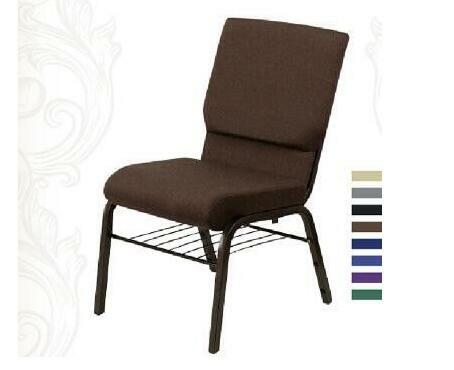 Interlocked or linked church chairs are popular due to the fire regulations for seating at many public venues. “Ganged” church chairs can also create the illusion of pew type seating for your traditionalists and, depending on the design of the linked chairs, can create more seated spaces. If your venue is used as a multipurpose space, stacking for storage is also important. Some churches like to stack some spare chairs at the back of auditoriums to have on hand when there is an overflow. Being able to easily lift a chair from a stack and set up new rows creates a flexible and adaptable space (and also avoids the awkwardness of the latecomer chair search). These days flexibility is key for churches. A number of churches use their halls, auditoriums, or sanctuary as multipurpose venues. For these types of arrangements, church chairs need to be easy to move, stackable, and relatively lightweight – while still being sturdy. Stackable church chairs are especially valuable when you have a space that needs to set up and packed down frequently. A church chair trolley is also handy in these situations. Planning for flexibility means you won’t be disappointed when future opportunities for the use of your church arise. Seating is not only functional but adds to the aesthetics of an auditorium space. There is a range of both classic church chair and modern church chair designs in a huge range of colors and finishes to suit the styling and decor of almost any venue. Interior designers and architects often get involved in this stage of the process for churches, particularly if the building is a refurbishment or a new project. Often, the church seating or furniture is the focal point of the design. Along with searching for a good aesthetic fit, it’s important to choose a fabric for the chair that is commercial grade with a high level of double rubs for longevity. Finally, your decision to buy new church chairs often takes time, consultation, and resources. Make sure that your chairs come with a warranty to safeguard your investment.